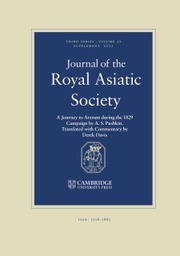 The Journal of the Royal Asiatic Society has been published by the Society since 1834 and is distinguished not only by its longevity but also by its consistency in providing a forum for scholarly articles of the highest quality on South Asia, the Middle East (together with North Africa and Ethiopia), Central Asia, East Asia and South-East Asia. It publishes articles on history, archaeology, literature, language, religion and art, and reviews of books in these fields. Mongolic Copies in Chaghatay. By Éva Kincses-Nagy. (Turcologica 115). pp. 292. Wiesbaden, Harrassowitz Verlag, 2018. Japan on the Silk Road: Encounters and Perspectives of Politics and Culture in Eurasia. Edited by Selçuk Esenbel. pp. xvi, 374. Leiden, Brill, 2018.